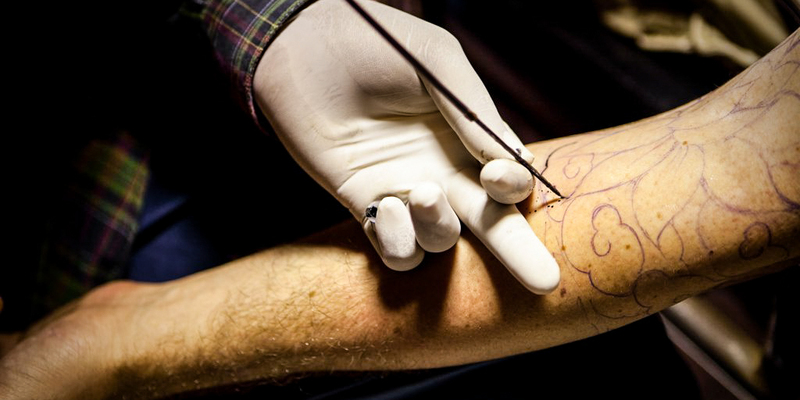 Getting a tattoo in Thailand has become increasingly popular among Farangs (Thai for foreigners). 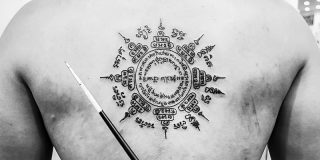 Many look for the traditional Sak Yants (blessed tattoos), done in a temple or another location arranged by a tourist agency, but some just want a nice tattoo in the pretty Thai alphabet or with Thai traditional designs, or maybe to try the hand poked tattoo technique first hand. Mind that the traditionally used bamboo needle is not really applied anymore – nowadays most tattoo places use a stainless steel needle or just a tattoo gun. This is mainly for hygienic reasons, and also because the bamboo needle, being too light, requires a lot of force to penetrate the skin making it much more painful. 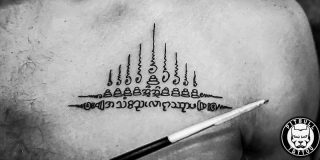 So, if you’re already planning your Thailand trip and will stay on Khao San Road – or visit this (in)famous backpacker’s area – here we have a list of the most popular tattoo parlors on the Khao San Road area where you can get a nice ink done. Max Tattoo Bangkok is a very popular tattoo studio located on Khao San Road. Inaugurated in 2000, they offer a variety of tattoo designs and styles by their award winning tattoo artists with over 15 years of experience. You can also come with your own idea and they’ll create a design for you on the spot. Plus, they offer a free consultation before getting your tattoo, and it’s the first tattoo studio in Thailand to have an internationally recognized tattoo license. They are open every day from 12 to 11 pm. InkAddict Tattoo Thailand is a tattoo studio located on Soi Ram Butri (Rambuttri road), a street parallel to the Khao San Road. It offers a wide range of tattoo styles plus the possibility of custom work based on your ideas. They are open daily from 10 am to 1 am. Eak Tattoo Studio is part of the Eak Tattoo Group (also known as Ake Tattoo Group). The group has different branches of tattoo studios around the Khao San Road area, plus it’s one of the most well-known tattoo equipment suppliers in Thailand. They are open for business daily from 10 am to 9 pm. BKK INK Tattoo Studio is located on Thanon Tanao road, near popular Khao San Road in Bangkok, Thailand. They have been open since 2009, first with only 2 tattoo artists, and now they work with 7 highly experienced and specialized award winning tattooists. The studio also offers traditional hand made (hand poked) tattoos. They are open every day from 12 pm to 12 am. Pumpkin Tattoo Studio currently has 2 studios, both on Khao San Road. The main studio has 18 years+ experience in providing good quality tattoos. They are open every day from 12 to 10 pm, and they accept walk in customers. They work only with machine guns, with prices starting at 2000 baht. Divine Ink Tattoo Thailand is a tattoo studio with two locations, one on Khao San Road and another on a little side street near Khao San Road. It provides quality tattoos of different styles and also custom work by experienced tattoists. Plus, they also sell tattoo machine guns. They open daily from 1 pm to 11 pm. St. Martin Tattoo Studio is also located on Khao San Road. They offer traditional hand poked tattoos (still known by many as bamboo tattoos, although they are now made with steel rods) as well machine gun tattoos. Up2U Tattoo Studio is located on Khao San Road and has been running for 11 years. The designs can be created freehand by their highly experienced team of tattoo artists based on your own ideas. They are open every day from 12 to 11:30 pm. If you’re interested in getting a traditional Sak yant given by a monk you can visit Wat Bang Phra – a Buddhist temple in Nakhon Chaisi district, about 50 km west of Bangkok. Known as the “Sak Yant Tattoo temple,” it offers daily blessed tattoos given by the monks that live there. Be sure to arrive in the early morning and prepare to wait in line for your turn. The tattoo is for “free,” but you are required to give a donation (donation buckets are sold at the temple). And, if you want to learn the art of tattooing in Thailand, that is certainly possible as well. 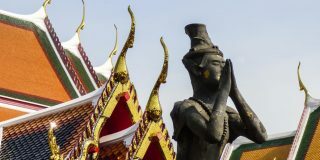 Here on this article we’ve listed the schools we found that offer tattoo courses in Thailand for foreigners.